Romania is situated in South Eastern Europe, at the northern end of the Balkan Peninsula. It is bounded to the east by the Black Sea, Ukraine and the Republic of Moldova, to the north by Ukraine, to the west by Hungary and Serbia and to the south by Bulgaria. Romania covers a total of 238,391 km2, a little less than half the size of France, or around five times the size of Switzerland. Romania has a beautiful and diverse landscape, with mountains (the Carpathians rise to a maximum height of 2,543 meters), forested hills, fertile planes, the Black Sea Coast and the Danube Delta. The three main historical regions are Wallachia in the South, Moldova in the East, and Transylvania in the North Western part of the country. Apart from the Danube, Romania's major rivers are the Mures in Transylvania, the Siret and Prut in the East, the latter of which forms much of the border with the Republic of Moldova, and the Jiu, Olt, Arges and Ialomita in the South. Romania is situated in the Eastern European time zone, i.e. GMT+2 hours. Romania has a typical continental climate, with cold winters and hot summers. Average temperatures in the capital, Bucharest, are +23° C in July and -3° C in January. These can fluctuate greatly. Further north in the country, winters are usually much colder and summers somewhat cooler. Romania is a republic, with a new Constitution adopted by public referendum in 2003. A bi-cameral parliament and a president are democratically elected every four years. The president has specific attributions in matters of national security and foreign affairs. The system can be characterized as a semi-presidential one, with the president having somewhat less constitutional power than in the French model. The parliament of Romania is formed of the chamber of deputies (345 members) and the senate (140 members). The internal structures of the two chambers of parliament consist of the presidents of the chambers, the standing bureaux, the parliamentary committees, and the parliamentary groups. Romania is in the EU and in NATO. Romania is divided into forty administrative districts ("judet") and the Municipality of Bucharest. Each "judet" is administered by a Prefect (appointed by the Government) and a Judet Council. Mayors and local councils are elected in all towns and communes. The new Government took significant measures aimed at strengthening the role and effectiveness of local government throughout Romania, as part of a general decentralization drive. Bucharest is the capital of Romania, and the administrative and commercial center of the country, with a population over 2 million. The total population is 22,698,974 (in 2002), of which approximately 52.7% is urban. 89.5% of the population is ethnic Romanian, while the most important minorities are Hungarian, Gypsy/Rroma, German, Ukrainian, Turkish, Tatar, Serb, Russian and Jewish. The official language of Romania is Romanian, a Latin-based language with close affinities to Italian. The most frequently used foreign languages in Romania are English and French, although in some parts of Transylvania German is also spoken. About 87% of the population are Orthodox Christians, belonging mostly to the Romanian Orthodox Church. The other most important churches are Roman Catholic, Lutheran and Calvinist. Romania's Muslim community is concentrated near the Black Sea coast, while synagogues in most large towns serve the country's dwindling Jewish population. Job opportunities for spouses are limited in Romania, given the overall poor employment situation and the large difference between Romanian and Western European salary scales. However, temporary opportunities may be found in the emerging private sector by spouses with specific professional training and experience, particularly in business and management. For those with motivation, time and some experience, many volunteer opportunities exist with Romania's emerging NGO community, covering areas as diverse as human rights, environmental protection, services for children and the elderly, etc. There are many retail outlets in Bucharest, and shops now take credit cards. There are also a big number of supermarkets in Bucharest. Most types of food, both domestically produced and imported, are now widely available in Romania. Good Romanian wines are also available. The best are Murfatlar (medium white and red), Jidvei, Tarnaveni (dry white), Dealu Mare (red), Cotnari (sweet white) and Odobesti (red). A variety of international alcohol and tobacco brands are readily available. There are several good painters and sculptors in Romania. Equally, there are some antique shops and art galleries worth visiting. In addition to hotel dining rooms, there are many restaurants in Bucharest and other major towns, serving Romanian and international cuisine, from which the best represented are Chinese, Italian, Indian, Arabic (Lebanese), Greek and French. While most of the top-class restaurants accept credit cards, cash payment is only permitted in national currency. Fast-food restaurants are also available in Bucharest, including international chains such as McDonald's (which also has outlets in all major cities), Pizza Hut and KFC. Regarding the Romanian postal service, this is reliable and fast. Air mail to and from Europe and North America can take from 3 days to two weeks. Domestic mail within Romania usually takes several days. Telephone and fax services in general work well. To phone abroad from Romania, dial 00, the country code, the city code and subscriber's number. Public telephones (suitable for direct international calls) are available all over Romania. Private cellular telephone services are now available in all the country. Electronic mail (e-mail) is also available and is becoming more widespread. Internet cafes are numerous in Bucharest. Most households and hotels in urban areas receive cable television, with a fair choice of international channels. There also are several private Romanian TV channels, alongside the two national public channels. Privately owned radio stations are numerous across the country. Cultural events are frequently organized in Bucharest - music festivals, open-air concerts, exhibitions, fairs. Romanian theatre is also of high quality, although language may prove a problem for non-Romanian speakers. A variety of theatres offer a good mixture of Romanian and other drama. Cinema theatres display mainly American movies, but European (mostly French) films are also shown, always in original version, with subtitles. Bucharest enjoys a rich musical tradition, with a variety of concert venues and weekly music programmes. During the season, the National Opera for Opera and Ballet also offers an excellent programme. The Operetta offers good performances of Central European favourites. Many provincial cities also have a symphony orchestra and an opera house. Tickets for all performances remain extremely inexpensive, but should be bought in advance. A large variety of books is published, and some books in foreign languages (mostly English and French) can be found in bookstores downtown Bucharest. The British Council, L'Institut Français, Goethe Institut, American Cultural Center, Casa de America Latina and Instituto Italiano di Cultura also have lending libraries in Bucharest.A limited range of international periodicals and newspapers is available in some shops and hotels. There are two Romanian foreign language daily newspapers: "Nine O'Clock News" and "Bucharest Matin". Bucharest and most other cities also have a number of museums, with impressive vestiges of Romania's colourful history. The Art Collections Museum and the National History Museum are well worth a visit. Museums are usually open from 10:00 to 18:00 hours, and charge a nominal entrance fee. Most museums are closed on Mondays. Bucharest has a vibrant night life, including nightclubs, casinos, live rock and jazz music in clubs and pubs, especially on week-ends. However, this might not be the case outside major cities. The Carpathian Mountains two hours north of Bucharest offer wonderful hiking opportunities with the possibility of overnight stays in local hotels or family accommodation. Busteni is a good base for expeditions, and accommodation can be found easily. In winter, there are several ski resorts, of which Sinaia, Predeal and Poiana Brasov are the best known. The Danube Delta is unique in Europe for its fauna and flora, and boat trips from Tulcea to Sulina at the mouth of the Delta give the visitor a complete visit. Good bathing can be had along the length of the Black Sea coast, although in summer the resorts can be very crowded. There are many places off the beaten track, however, which attract much fewer people. A number of thermal and mineral spas around the country offer a variety of treatments and cures. The best known spas are Baile Felix near Oradea, Tusnad near Miercurea Ciuc, Sovata near Targu Mures, and Baile Herculane near Orsova. Interesting Orthodox monasteries can be found in most parts of the country, but the best known and most beautiful are in northern Moldavia and Bucovina (listed by UNESCO as universal patrimony). The old towns and fortified churches of Transylvania are also well worth a visit. Brasov, Sibiu and Sighisoara, together with the surrounding villages, offer the visitor a different view of Romania and its history. The countryside along both sides of the Carpathian range is splendid, and the Trans-Fagarasean road, open only in high summer, crosses the range from North to South. This drive, in either direction, provides spectacular views. The most popular sport in Romania is football. There are also strong traditions in gymnastics, rugby, rowing, volleyball and athletics. There are several sports facilities for amateurs, and the Diplomatic Club on the northern outskirts of Bucharest offers tennis courts, a golf course, a swimming pool, restaurants, etc. Most important provincial cities are served by daily flights from Bucharest's domestic airport (Baneasa). A good rail network connects most of the country. Trains are inexpensive and rather punctual, although slow. Sleepers are available on overnight trains on main routes. It is recommended to buy all tickets in advance. All towns have local public transport networks, and Bucharest has an underground Metro system. Metered taxis are abundant in all towns (average cost is equivalent of USD 0.35 per 1 km). The road network in Romania is extensive, although poor conditions mean slow driving. Fuel stations can be found easily on major routes. A growing number of international air carriers serve Bucharest's international airport (Henri Coanda). These include Tarom (Romanian Airlines), Air France, Alitalia, Austrian Airlines, British Airways, Delta Airlines, KLM, Lufthansa, Malev, Swissair etc. A number of international flights also touch down in Timisoara, Arad, Constanza (on the Black Sea coast), Suceava, etc. Bucharest has daily direct train connections with Berlin, Budapest, Istanbul, Munich, Warsaw and other regional cities. 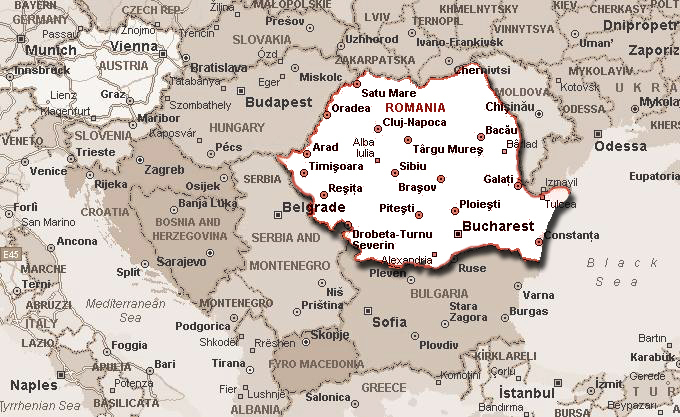 Romania is also easily accessible by road from most European countries. Current upgrading of most border crossing facilities is reducing the time spent at the border, but serious delays can still be expected, especially during the summer months. Most European driving licenses are accepted, and international car insurance ("the green card") is required. Dogs, cats and other pets are allowed to enter the country on presentation of anti-rabies certificates. Many western carmakers are represented in Romania, such as Volvo, Renault, Mercedes, Porsche, Fiat, from whom new cars and spare parts can be bought. Locally produced cars (Daewoo and Dacia-Renault) are cheaper and readily available. The Romanian banking sector is currently undergoing a process of privatisation and restructuring. A fair number of foreign banks are active in Romania. Banks close early and are busy on Fridays. Some banks are open on Saturday. The American school offers classes for foreign children from kindergarten to the 12th grade and the French school for the entire school age range. There are also elementary schools teaching in German, Italian, Japanese, Russian and Arabic, organized by different embassies. An instituted MBA programme in English at the University of Bucharest is also open to foreign students. Currently, there is no security phase in effect in Romania. However, house and vehicle break-ins, petty theft and street robberies without violence have been reported in Bucharest, where most of the expatriate community is concentrated.